This website is dedicated to the early history of the city of Buffalo and the Niagara Frontier mainly through the use of my art. The site will be an ongoing adventure that will cover the periods from La Salle in 1678 to approximately the 1860’s the beginning of photagraphy. I am stopping there as it does not seem to be much fun embellishing what the camera has already recorded. After all history like wine gets better with age. Of course I am a working artist so I will be offering many of my images for sale, hopefully you will find the stories behind the images so compelling that you would like to have the more detailed art prints themselves. I am beginning with a the chapter on Benjamin Rathbun and Buffalo of 1836. 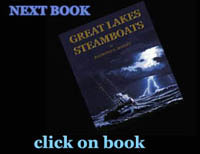 Following this will be chapters on La Salle, Buffalo and Black Rock of 1818, and the early steamboats. Being but one person who is in his very senior years, and wearing a dizzying array of hats there will probably be some time before additions can be made to the website. Do not dispair. If I am not working I am thoroughly enjoying the alternative. I have created this documentary so as to introduce the reader to that wonderful scoundral Benjamin Rathbun and of Buffalo around 1836. The Buffalonians that lived through this decade looked back with loving fondness to their frontier city and the boom and bust excitment of the Rathbun era. Despite the calamity that he caused his trial had to be moved from the city as prosecutors believed that a conviction in Buffalo would not be possible. If this video tickles your curiosity, please consider reading the article starting below. Benjamin Rathbun was the great mover of his times - yet he was as enigmatic then as he is today. He kept his family close and his secrets closer. This description may well fit Bernard Madoff the man behind a modern day “Ponzi” scandal as it does Rathbun. Both men trusted only immediate family into the top management structure. Both men demanded above all, loyalty. Both men were able to decern the needs of others and act on it. Both men were the sensation of their day as their crimes brought financial ruin to many on a magnitude never seen before. There are many similarities between Madoff and Rathbun, but there are also differences. The most obvious difference is that Rathbun, despite his conviction, probable did not commit the forgeries at all. There is also the “why”. Rathbun needed the supply of the financial fuel for his vast construction projects, wheras Madoff turned out no product at all, his drive was to make “more” . In the end it made little difference both men had wandered into a financial quick sand and the more they struggled the more they sank. Knowing the end does not lesson the story, for like the Titanic’s sinking, we are swept up in the drama and scale of the tradgedy.